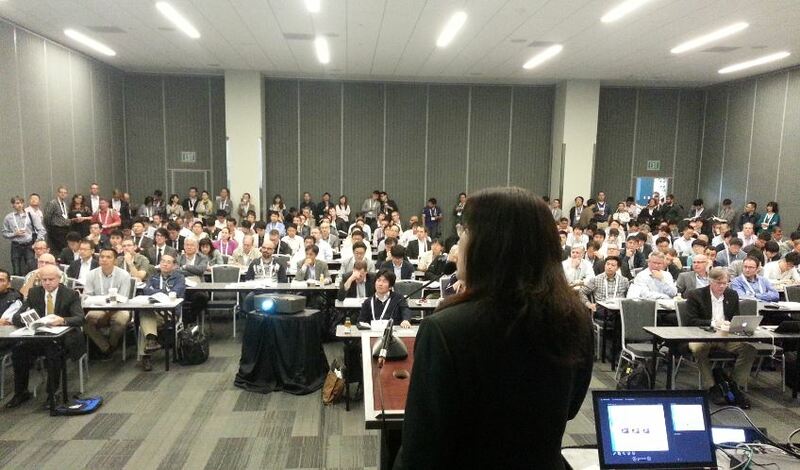 high resolution Archives - Touch Display Research, Inc.
SID 2015 DisplayWeek is held in San Jose, California this week. I taught a seminar on Monday morning, titled “Display Market Forecast –LCD, OLED, e-paper and touch, from main stream to emerging display”. When I arrived the seminar location at 8:15am, (15 minutes before it starts), the room is full of attendees already. I first listed the hot trends in display industry in 2015 and 2016. Then I provided the global display industry market forecast from 2015 to 2025. The overall display industry growth is slowing down but there are hot trends in many areas. The new opportunities in display market include: quantum dot display, flexible and curved LCD display, high resolution, OLED display, e-paper display, embedded touch screens. 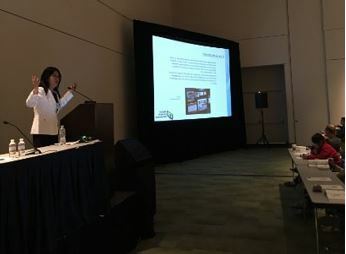 Figure: Dr. Jennifer Colegrove taught Monday Seminar at SID 2015 DisplayWeek. Photo credit: Ogawa-san at Japan Display Inc.
More and more people joined the seminar, many of them had to stand for the one and half an hour seminar. (I feel grateful and honored.) 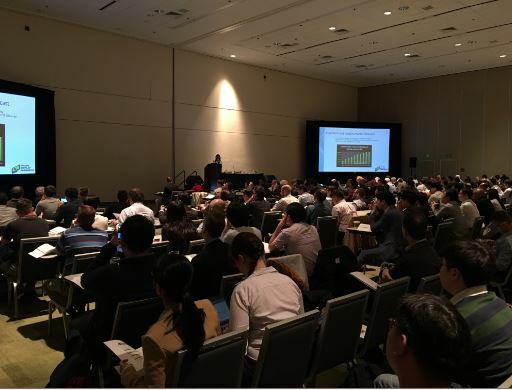 From the questions the attendee asked at the Q&A session, many people are interested in 3 areas: quantum dot, high resolution, flexible display, touch screen. More analysis can be found in the “Quantum dot 2015 report”, “Flexible, curved and foldable display 2015 report”, Touch and Emerging Display monthly report, June 2015 issue. This entry was posted in 4K, 5K, 8K, AMOLED, bi-stable display, Conference Review, Displays, Flexible curved display, Flexible touch screen, high resolution, OLED, Quantum dot, Touch screens and tagged Display market, Display market forecast, flexible and curved, flexible display, Monday seminar, quantum dot, Quantum dot market forecast, SID 2015, Touch screen on June 6, 2015 by jennycolegrove. 4K TV has been in the market since 2012. 4K display monitor also entered the market since 2013. Thus 4K resolution is not “very advanced” by now. What “wow” people now is 5K and 8K displays. As we covered in “Touch and Emerging Display” January 2014 report, several companies have demonstrated 5K display or 8K displays. Today, Apple announced its new iMac All-in-One PC with a 5K (5120X2880=14.7 million pixels) retina display. The Retina 5K display has four times more pixels than the standard 27-inch iMac and 67 percent more pixels than a 4K display. 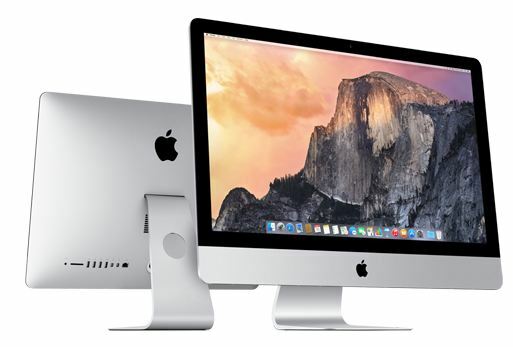 The iMac with 5K display is shipping now at $2499. Dell announced a 27” 5K LCD monitor last month, in September 2014, but indicated “The Dell UltraSharp 27 Ultra HD 5K Monitor is USD $2,499.99 and will be available in the fourth quarter of this year.” It’s not available yet today. Therefore, Apple beats Dell at 5K. Which other companies are shipping 5K? How did Apple achieved 30% power saving? 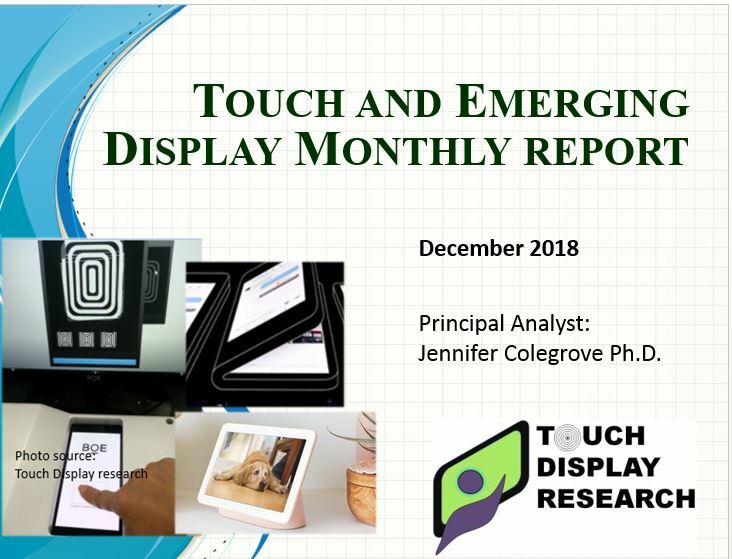 More analysis and comparisons will be in the “Touch and Emerging Display” monthly report. This entry was posted in 4K, 5K, Displays, high resolution and tagged 27", 5K, All-in-One, Apple, Dell, iMac, Monitor, Power saving, touch and emerging display on October 16, 2014 by jennycolegrove.